I started carving stone about 12 years ago. I got very excited when I came across a large sculpture symposium in the centre of my home town (Christchurch). I took a small piece of Oamaru stone home and started to experiment with it sculpting a small head. I considered myself to be a pretty good artist and I knew that I could take this further. Shortly after that day I was working on a building site and next door there was a new house being built out of Oamaru stone. They had a big pile of off cuts at the end of the driveway and when I asked if I could take some, they said help yourself. So I loaded the van full of Oamaru stone. Everyone thought that I had gone mad, but I was over the moon! 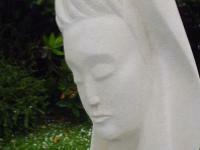 I then got to meet a professional stone sculptor in Kaikoura who ran a carving gallery. I took a few small pieces to show him. He was interested in my work and showed me some of the unusual tools that I had not yet heard of i.e. the rasp for carving stone. So that was it! I was hooked! I spent all of my free time and weekends creating sculptures mostly for the Kaikoura gallery, and I was regularly selling my pieces. A couple of years then passed by. I was very creative with both my sculptures and paintings and I was beginning to gain some interest with the galleries. So I decided to endeavour to work as a full time artist. My paintings became more and more detailed. There was good demand for them and they fetched a good price so they took up most of my time. But I always wanted to work on a large sculpture. My chance came through my local community. A commission for a stone bird bath for the people of Packe Street Park. I jumped at this opportunity! It was a fantastic project and the community loved it. On the night of the unveiling there was a lot of anticipation with many people coming to view the finished piece. The scene was set with bamboo flamed torches setting a nice backdrop for the sculpture. There were many speeches and then with an airy sound of an Irish tune played in the distance the Goddess Of Flora was unveiled. stone bird bath for the people of Packe Street Park. On the day of the unveiling it was decided that people could have a go carving stone with all of the off cuts that where left over, and I would teach them the basics of stone carving. I was then encouraged to teach stone carving through adult education, night classes. By now I was really getting outside my comfort zone but I decided to take on the challenge. After the beginner's class came to an end, the students approached me and said "now what"? It was obvious: I had to run an advanced class in carving stone too. So for the last 9 years I have continued to run night classes. I have found it to be really good fun and I have met some fantastic people. It is great to see them get hooked into stone carving as well. I then decided to take my sculpture lessons to a whole new level. I decided to run stone carving workshops; this meant becoming portable and being able to teach stone carving anywhere. So I went of to purchase 10 foldable benches, at this point I decided that I had gone mad. It didn't take long to get a return on my investment and I now run classes for school holiday programmes, women's groups, large events, community groups, private functions and many other organisations. My objective is simple. Stone carving gives people a chance at being creative artistically by using this very simple medium, for some, this is their first introduction to the arts. What ever their skill level they can go from a very basic sculpture to designing and creating some really good works of art. Some of my students have gone on to sell their work with reputable galleries. But for many it has become a whole new passion. People have used it to express who they are and how they see the world that they live in. They find carving stone to be very enjoyable and therapeutic. 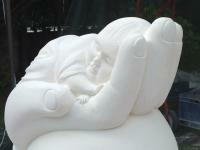 Stone carving for children is a really big deal, they love it!! And they get really upset if they think that they are going to miss out. Creatively they too get introduced to the arts through sculpture. They are outside working with their hands instead of being inside in front of their x-box. 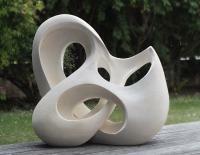 This website is yet another way to introduce, inform and teach about stone carving. You get to see the students work and read their stories; find practical advice to help you as you take on your own project. This website is another project that I will continue to work and provide good quality content. Thank you for being a part of it!